From a look-out near Iqaluit, where I was studying Inuktitut at Nunavut Arctic College, there was a view over the mountains across the bay. The mountains were topped with an icy sheen where the horizon met their peaks. Out on the bay below, furious, frozen waves. These seemed to be rolling towards half-buried plywood shacks in the ice along the beach. A week ago, the outside temperature had dipped to a blustery windchill of minus 50 C. A thin haze of snow whipped about, making it hard to see anything — an “almost blizzard” in Inuktitut. In the South, blizzards come from the sky. In the Arctic, they seemed to rise out of the land on the wind. This time of year is called “pre-spring” in Inuktitut, a state of being more than a fixed period of time. One morning revealed a bright and warmer May sun. By midday, the roads actually began to steam, puddles and potholes appearing from quickly melting ice. In the afternoon sun, snow vanished around rocks and left impossible looking sand castles out of sand formerly caught in drifts. On the streets, children rode their bikes unsteadily. Parkas were exchanged for windbreakers, and sealskin kamiit boots for rubber boots. Behind the Navigator Hotel, a merry group in bathing suits brought out a portable hot tub. They basked in the sun. The sky was totally cloudless, a pale, almost transparent blue. The weather held, and I decided to go to Pangnirtung, a community about an hour by air up the eastern Baffin Island coast, where I was to stay at the home of a friend. I’d never been out of Iqaluit at that point, and never further north. The small plane flew for more than an hour, low over the rounded, rocky surface of Baffin Island. I was sitting there in the front with the pilot when he pointed out an opening in the cliffs ahead. 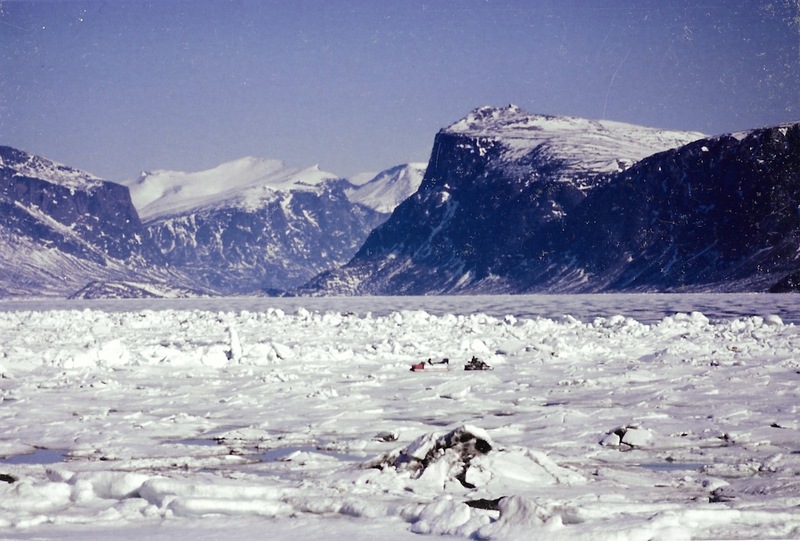 These cliffs, even from a distance, formed a high wall of rock, a steep edge around the ice. We approached them, then darted into a fiord carved between the rocks. Before us, the high mountains of Auyuittuq National Park, the place that never melts. In the afternoon, I walked all around town, down by the shore where blocks of ice were banked up into the air. On the ice, which was already beginning to open up into cracks, families on snowmobiles headed off down the fiord for a weekend of hunting or ice fishing. The exhaust from the machines mixed with the clean perfume of melting snow. Many families were already out on the land, hunting seals. The seals had already birthed their young. They carved out snug caves for their pups under the snow, around the air holes in the ice. Hunters said they looked for small indentations in the snow, the telltale trace of these caves. They’d jump on any small mound they find, closing the air hole below. The seal pup would be waiting by the hole for its mother will appear. It was then tied to a line, the air hole was reopened and the hunters dangled the tethered young seal down under the water. When the mother grabbed her pup, the two would be dragged out and killed. Soon, the young seals would no longer be nursing. The snow was disappearing fast. The seals would move into the water. Then, hunters would station themselves at the exposed air holes on the ice waiting for the young, out-of-breath seals to come up for air. “You sit by the holes, the sun is shining. There is absolutely no noise. Maybe a little wind. You stare into the hole. Your friends are waiting around you. It’s a peaceful feeling,” said M. a young man I met in Iqaluit. Depending on the seal’s age or his hunger, M. said he would eat his catch boiled or raw. For him, seal hunting on the ice meant spring: the return of light, life and food. And the sealskins, made into warm boots, would keep him and his family warm during the winter. On that spring day in Pangnirtung— a place better known by its short name of “Pang”— everyone I met was smiling. Silatsiaparaaluk or “What a great day!” we said in greeting. I managed to find a spot on the shore where nothing of today’s community could be seen. I saw only the spare red and white lines of the old blubber station where Inuit women once flensed the whalers’ catch. In the background, three mountains, whose intersection in ridges of shadows and snow formed the same view that the first visitors to Pang saw more than a century before. I decided to pay a visit to the visitors’ centre that houses a library, museum and elders’ room. I was talking to Margaret Karpik, who then ran the centre, when a short, white-haired old man came out of the elders’ room. “It means “cute, little”,” I suggested, fresh out of my Inuktitut course. “But I’m sure I never heard that expression when I lived here,” he said. His name was Otto Schaefer, a retired doctor from Edmonton, who, some 40 years earlier, had lived in Pang. 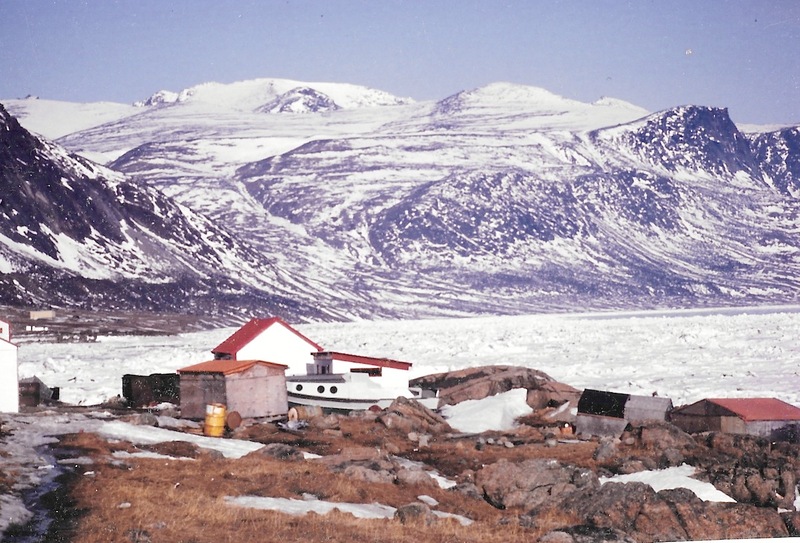 Then, Inuit still lived out in camps around the Cumberland Sound area. They were often sick, and Dr. Schaefer would visit them. He was back in Pang, he said, for a final visit, to see his dear friend Etooangat, who used to take him to the camps. 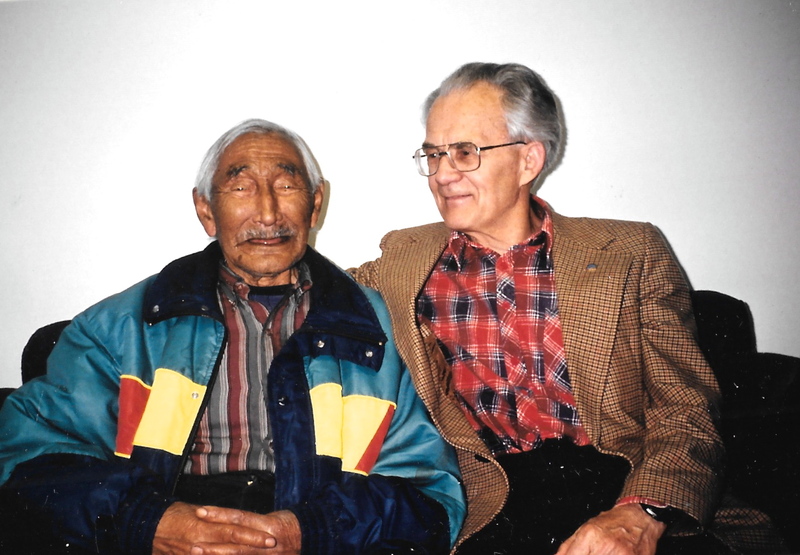 Etooangat, by then, was in his 90s, the oldest man on Baffin Island and the last of Pang’s whalers. I had my camera with me and I asked the two old friends if they’d like a photo of their reunion. The two sat side-by-side on the couch, the doctor, with his glasses, flannel shirt and sports coat, Etooangat in a bright spring parka. In the photo, the doctor has his arm around his friend, both men with smiles on their faces. The shared pleasure in the moment was clear, and I kept this photo of the two happy, elderly men on my desk long after that day. Years later, I learned that Etooangat had finally passed away. Over the years I also learned more about Schaefer, too, that he was the first to systematically study northern health, after coming to Canada from Germany in 1951. In Aklavik, and then in Pangnirtung, he fought epidemics of tuberculosis, German measles and meningitis with every medical tool available to him. 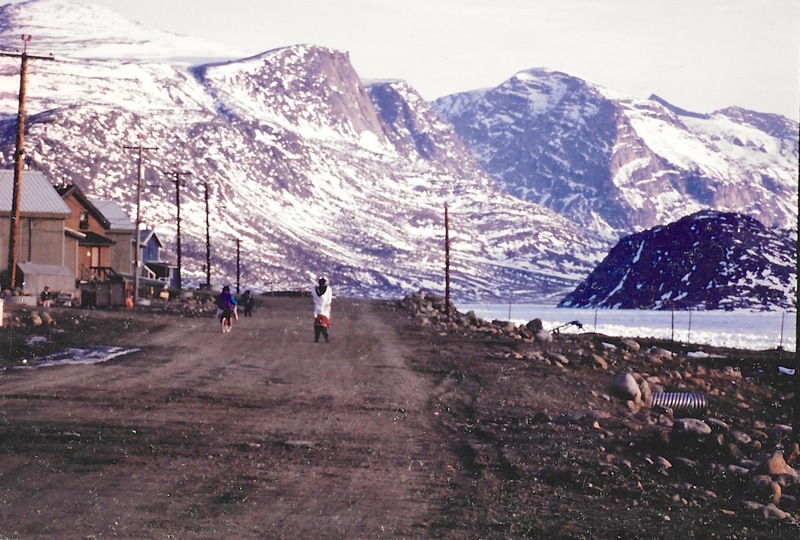 Schaefer, who died in 2009, also wanted to understand and conquer what he called the increasing number of “diseases of civilization” affecting Inuit — tooth decay, fetal alcohol syndrome, diabetes, and anemia. Schaefer and Etooangat worked together at Pang’s St. Luke Hospital. During one epidemic Etooangat worked for three days without sleep, helping to give inoculations and transport the sick to the hospital. “When you see so many sick people, you want to help in whatever way you can,” Etooangat said. 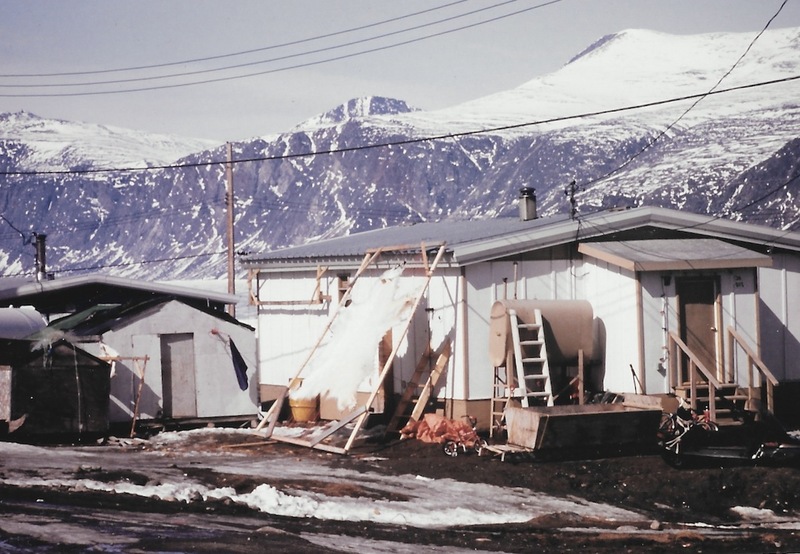 Both devoted to relieving misery, Etooangat and Schaefer formed a tireless pair, working closely together in 1956 and 1957, when the doctor and his young family lived full-time in Pangnirtung. “His knowledge of weather, ocean, land and ice conditions and his skills in living on the land have helped the Inuit survive during a period of rapid and tumultuous change,” said Governor General Roméo Leblanc when he presented Etooangat with the Order of Canada in 1995. After leaving the elders’ centre that day, I walked to the far end of the community. There, the air was filled with the rushing sound of water. The bridge ran over a river where water is bubbling over a thick layer of green and blue ice. I went home very late that day. The following morning Margaret Karpik took me on a tour of the blubber station. Although we stayed in contact and I sent her a large copy of the photo of Schaefer and Etooangat, I wouldn’t see her again for many months. The next instalment of “Like an iceberg” goes live on April 10.